Editor's Note: Text below translated by Google from the original French. From the fourteenth to the end of the sixteenth century is spreading at banquets all princely ceremonial on the preparation and presentation of the dishes offered to the guests. Multiple sources, including the Chronicles of Olivier de la Marche, tell us about the feasts organized, for example, by the Dukes of Burgundy, where a ballet of carvers and other servants operated tirelessly to satisfy the guests. Room of choice, the game received as it should be a special treatment. The knife racks, wide blade without point were used by the "sharp-riders" responsible for serving meats princely table. Game pieces (wild boar, deer ...) were cut before the guests before the choice pieces are distributed to them. From the seventeenth century, these knives are disappearing, usage winning book at home master himself cutting meat it offered to its guests. Although their use is after the hunting party, we sometimes find these displays knife inside even hunting kits. The army museum model is a magnificent example of the art of metal in Europe the second half of the sixteenth century. 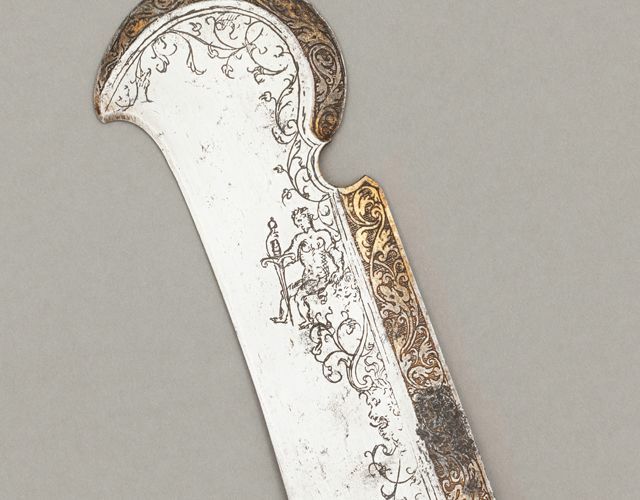 It consists of a blade, whose end is rounded sickle-shaped, decorated with gilded carved scrollwork and a character sporting a large sword (video 2). 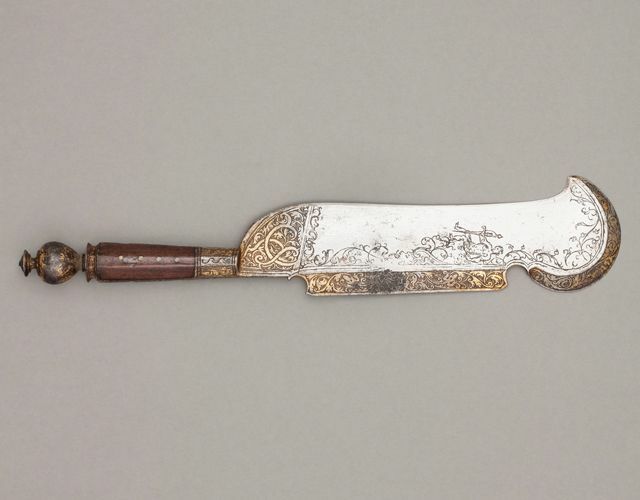 On the shell at the junction of the blade and of the fruit wooden handle, it reads the date "1575".